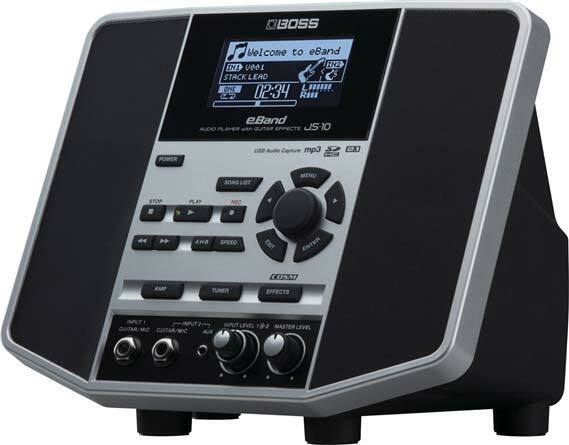 Shop Boss eBand JS10 Guitar Trainer Audio Player with Effects from AMS with 0% Interest Payment Plans and Free Shipping. The Boss eBand JS10 Guitar Trainer Audio Player with Effects is truly the ultimate tool for practice, performance and recording! 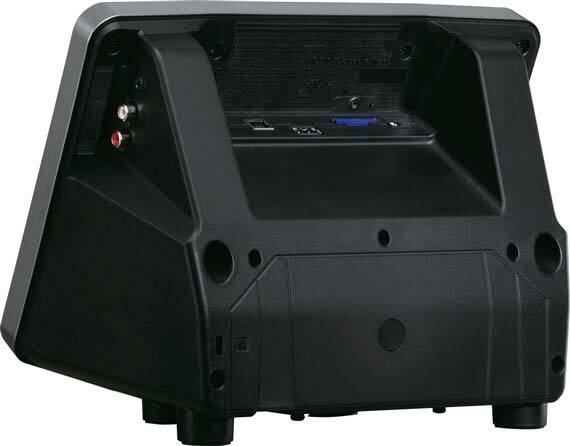 The eBand JS10 is self contained and small, but fills the room with full-range sound from its 2.1 sound system and pro Boss effects. Jam with a large selection of onboard song tracks and audio loops, and add your own library of favorite songs to play along with via USB or SD media. With the Boss eBand JS10, you can easily change the tempo and key signature of the songs with high-quality results, and record your performances, too. Two inputs for guitars, basses, and/or vocals allow for a wide range of uses. 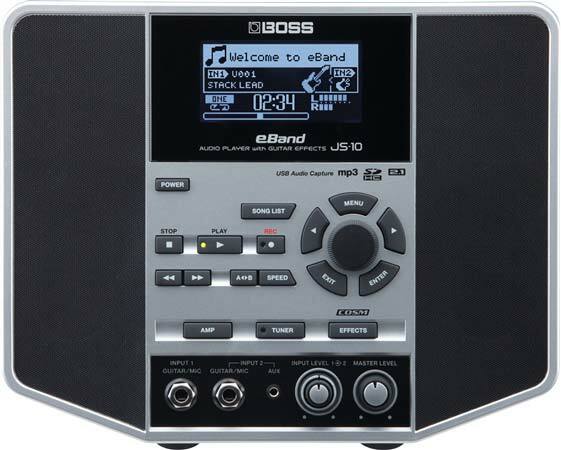 The eBand JS10 is the compact, all-in-one jam station packed with pro features and larger-than-life sound! The eBand JS10 from Boss is compact and travel friendly, but its performance is huge. 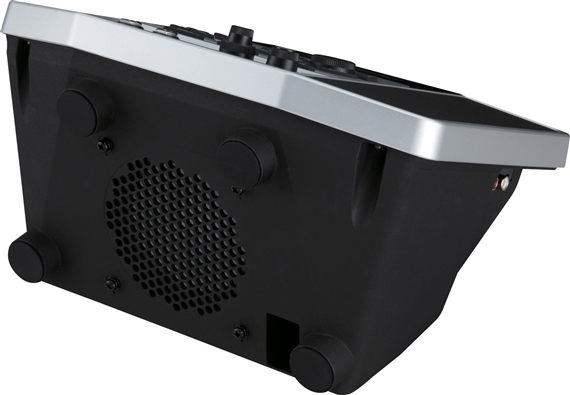 An innovative onboard 2.1 speaker system provides rich, full-frequency sound for song playback and the built-in effects and COSM amps, with deep bass that can shake the room. Get creative with the incredible Boss effects and COSM amps built into the eBand JS10 - equivalent in quality to the flagship GT-100 - plus cool extras such as direct recording and Center Cancel for minus-one play-along sessions. The Boss eBand JS10 is packed with cool new play-along tracks, including over 350 audio loops for jamming and 50 new songs. The selection is wider with new variations of instrument combinations, including minus-one audio for bass, two guitars, and guitar and bass. Your favorite MP3s and WAV files can be played back directly from a USB key, or imported into the JS10 from a computer via USB. 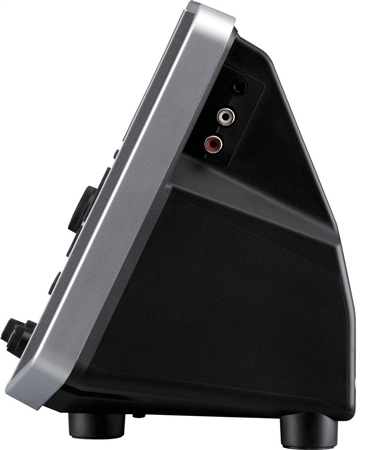 In addition, you can record your live performance with effects along with the songs into the JS10. With the Boss eBand JS10, you can jam along with your favorite songs, and freely change the tempo and key with high-quality results. You can also loop and repeat sections of a song, and slow down the fast parts to analyze, learn, and play along. eBand’s dual input channels are also an excellent learning tool. For example, a guitar teacher and student can connect their instruments to one eBand; the teacher demonstrates or quickly records a riff or solo using a built-in backing track, and then the student repeats the performance for the teacher using the same track. It’s a convenient, effective, and fun method for learning! Recording Time (eBand Songs): Hours per GB: 4 hours 32 GB: 130 hours The above-listed recording times are approximate. Times may be slightly shorter depending on the number of songs that were created. Recording Time (WAV/16 bits/Stereo): Hours per GB: 1.5 hours 32 GB: 50 hours The above-listed recording times are approximate. Times may be slightly shorter depending on the number of songs that were created. Recording Time (MP3/128 Kbps/Stereo): Hours per GB: 17 hours 32 GB: 550 hours The above-listed recording times are approximate. Times may be slightly shorter depending on the number of songs that were created. Dimensions (HxWxD): 8 1/4 x 10 7/16 x 6 11/16 in. Weight: 1.8 kg, 3 lbs. 16 oz. If there were 10 stars. My Boss eband js10 would be a 10. It's so easy to use. It's really worth money. I don't have to set up my amp. My Boss js10 is so convenient. You can take it anywhere and set it up on a table or floor.plug it in the outlet and you're ready to go. The sound is awesome. There's preset loops and effects that you can jam to. The first time I plugged my guitar in. It sounded amazing. It's great for anyone. You can either play solo or with a friend. If you decide to go solo, you're able to plug a mic in also. As I said. It's very convenient and it's worth the money. It's a great gear to have. Thanks AMS. Its just like my other boss products better then i thought it would be. A compact backup band to practice guitar at your speed. It has helped me immensely! This thing is really worth it. Let's say you want to tackle some Van Halen. 2 tube heads, power soak, mxr 90, eq boost, etc...Just the stuff that's not the guitar itself. 3 to 4 grand for gear that'll hold its value and sound right. This thing can go from Van Halenesque sounds to Tom Scholz with a few buttons to push. The ability to isolate and slow down parts is invaluable. I've taken on some stuff that I would never dream of tackling before. 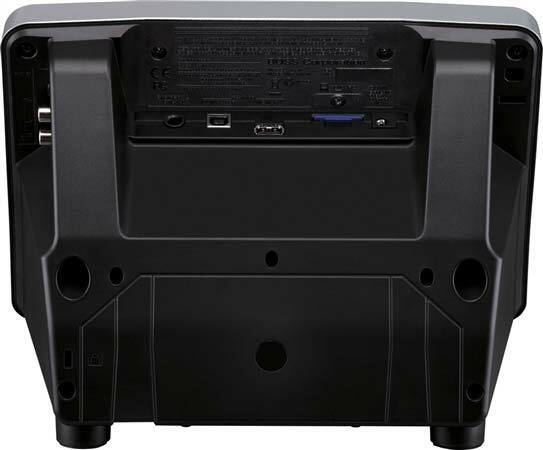 If there was one or two things I would change is a proper audio out, & not rca jacks. A better way to level up or down the backing song as well. It's worth every penny. This really is a great way to have your own band without headaches if you know what I mean. I hooked up mine to a powered speaker and that's the way to go if you want to play it loud it has a lot of great tones, songs ,you can put your own music in it by usb .well worth the money think..this little player has a lot inside ..
More then I expected. Easy to use.well worth the money. The eband will help improve my guitar playing. Easy to use has more setting than I will ever need . Sound is amazing. Play back function is incredible. This is a tool that every musician should have. Great sound. Easy to use. Lots of user friendly backings to make guitar practice more enjoyable. Great Deal at American Musical Supply with their three payment plan. Its a great tool for learning covers and for practicing in general. The cosm amp sims are not so great but good enough to practice with. The fidelity of the sound through the speakers is kinda poor at this price point. I expected more. A little more refinement and veristilty would improve the js10. Maybe in the js12?